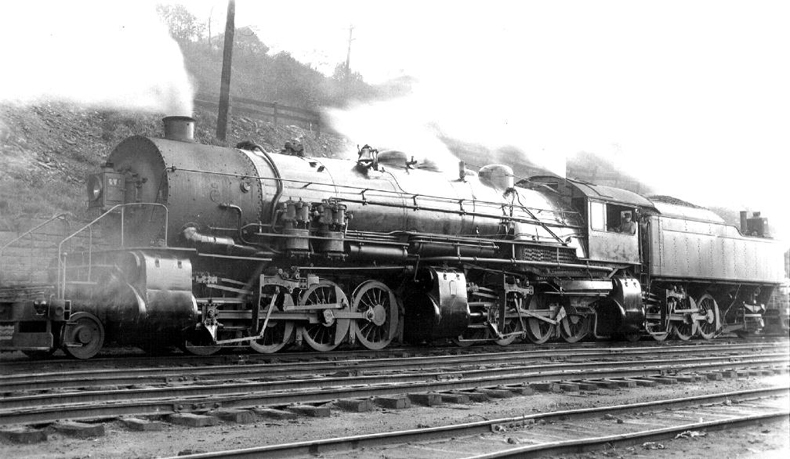 Baldwin Locomotive Works built three 2-8-8-8-2 locomotives for the Erie Railroad between 1914 and 1916 for banking services on the grades east of Susquehanna. The idea was basically very simple: use the weight of the tender for traction purposes by adding a third set of drivers. The center set of cylinders received high-pressure steam. The exhaust from these was fed to the two other sets of cylinders, which were valved for low pressure. The right cylinder exhausted into the front set of low pressure cylinders, and the left into the rear set. This way all cyliders could have the same dimension. In practise however the engines were less than sactisfactory. The design had several crippling flaws. What hindered the locomotive from developing its full potential was that the boiler could not raise enough steam to feed the cylinders. This was partly caused because only the front cylinders exhausted through the smokebox which in turn gave insufficient draught in the firebox. Therefore the engine used its steam faster than its boiler could procduce, leaving as dead iron on the road. Only when crawling at 5 mph (8 kmh) the boiler could cope. In pusher service helping heavy and slow trains they performed well. By 1930 all three were gone. In terms of tractive effort the Triplexes may well have been the strongest locomotives in the world. They simply outclassed everything in existance before it and after it. Even Union Pacific's Big Boy would have been no match for Erie's Triplex. Pity though that its indicated tractive effort was never measured or confirmed. . This model has been produced in batches from 2010. I had eyed towards it for some time but I found the price tag between $599 and $699, understandable as it may be for such a complex model, too high. But when I stumbled over a clearance sale at $299 the decision was quickly taken. It arrived in April 2016. Well this is what makes the Triplex a triplex: a third set of drivers. A sprung running axle, very good, but why not blacken the spring? The above two broad side views can be viewed in high resolution. Right click on the image and your browser will show an option "View image" or something like that.